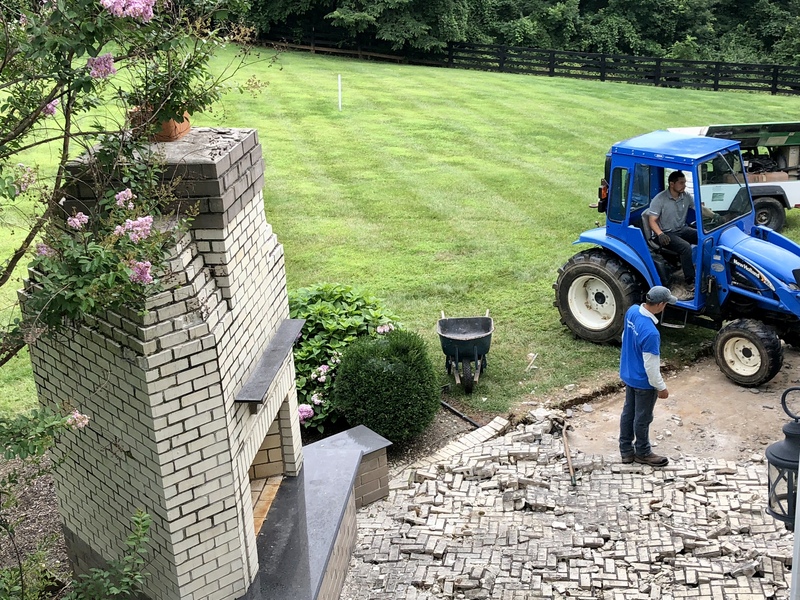 I have been very impressed with the execution and speed from my landscaping company in demolishing our existing patio and fireplace. Within a week, the brick patio was removed, the fireplace demolished and new concrete was laid. This is in stark contrast to the length of time it took to restore our front walkway HERE, four weeks plus! For many reasons, we decided against hiring the company that restored our front walkway again. We hired a different company to complete the back patio project. The front walkway project took way too long, mainly due to the fact that not enough workmen were dedicated to the job. In addition there are a couple issues with the walkway that need addressing…I’ll keep you posted about that progress. Let’s take a look at the reasons behind our decision to rip up the existing patio. The existing bricks are laid in a pretty herringbone pattern. With a good cleaning, could we bring this patio back to life? I wish…but sadly no. The bricks are badly crumbled. In numerous area of the patio, the bricks are beyond repair. Even if we could fix existing cracked areas, new cracks will continue to appear overtime. Several contractors suggested laying new stone over the existing brick. While we entertained this idea…mainly due to the cost benefits, we decided it wasn’t the proper way to repair the space. What if we laid new stone over the existing stone and the bricks continue to crack beneath the new stone..what a mess that could be in the future. It was a tough pill to swallow but ultimately, we decided the best decision was to start the patio from scratch. The process of digging up the existing brick begins. With the proper tools and numerous workmen on the job, the demolition was done swiftly. Jack hammers are used to break up the bricks and a backhoe is used to carry the debris from the construction site. The walkway leading to the screened in porch is ripped up as well. The area was cleared in less than a day..impressive speed. The granite countertop was removed from the outdoor kitchen bar. It was being held up by wood posts, supported by the brick patio. We will have to secure the countertop back on the island with support brackets to hold the weight of the granite. The two steps in front of the kitchen door are removed. Three new steps will be built, the third step creates a landing space for entering and exiting through the door. Heavy rain the evening after the demolition, created a bit of flooding. But happy to see the water is leading away from the house due to the slope of the concrete. Next up, fireplace demolition. Thank you for following along on our outdoor project. Hoping I can offer insight into your next project. You had me at “demolition”! Woot woot! Hi Joe! If you liked this one, you will love an upcoming post where we demolish our 12 ft outdoor fireplace…that was fun to watch! Thanks for visiting! All the best for your project’s completion! 🙂 Appreciate your hard work! Thank you so much, it’s a big project but will be worth it in the end.